Between its European vibe and its California weather, the Napa Valley is on many a short-list for honeymoon destinations. And what’s not to love? There are jaw-dropping views, world-renowned cuisine and wine, and a bucolic pace that inspires romance. 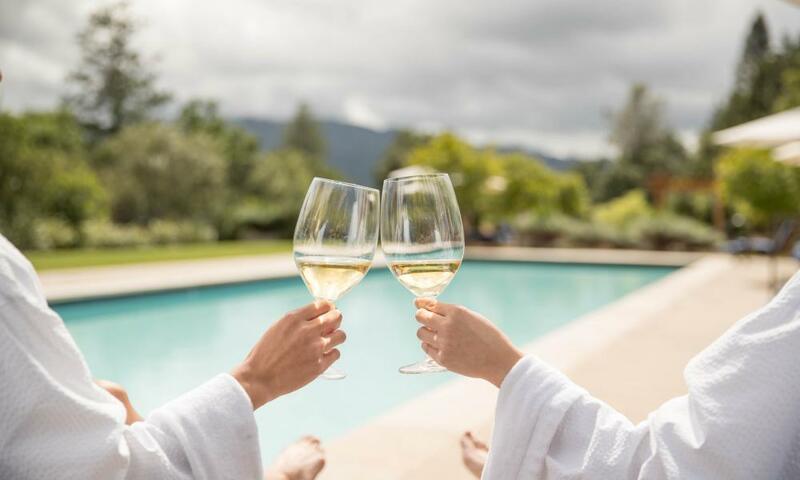 Whether you plan a long weekend or a two-week idyll, the wine country has plenty of options to celebrate your new togetherness. Here are ideas for the first few days to get you started. Choose your honeymoon hideout. Want to book an intimate B&B or small inn as a good base for local activities? Check out the Inn on First, La Belle Epoque, Milliken Creek Inn and Spa, or Churchill Manor in Napa; the Poetry Inn in Yountville; or the Cottage Grove Inn or Brannan Cottage Inn in Calistoga. Or stay put in a resort. Perhaps you’d prefer a larger resort, where you can hunker down and find all the services you need within close range. Try the Silverado Resort and Spa, Meritage Resort and Spa, Westin Verasa, or Carneros Resort & Spa in Napa; the Villagio Inn and Spa in Yountville; Auberge du Soleil in Rutherford; Meadowood Napa Valley in St. Helena; or Solage, Calistoga Ranch, or Indian Springs in Calistoga. Many of these inns and resorts offer honeymoon packages – be sure to inquire when you make your reservation. Now for how to spend your time. If you can pull yourselves away from the pool or your honeymoon suite, there’s a long list of activities to fill your days along the 28 miles of the valley. Day one, Napa. Breakfast in bed may be tempting, but get yourselves to Grace’s Table in downtown Napa for some excellent Chilaquiles or Iron Skillet Cornbread with Lavender Honey Butter. From there, you can do a leisurely stroll along Napa’s Art Walk near the river. Then make your way to Stags&apos; Leap Winery on the Silverado Trail for a tasting at this historic site, one of the oldest wine estates in California. The gorgeous stone house even has a turret and a Juliet-style balcony – great for a sweet photo. For lunch, head back to downtown Napa. If you’re oyster-lovers, you can order a dozen or two at Hog Island Oysters in the Oxbow Public Marketplace. Next stop, Domaine Carneros for a “Sparkling Suite” tasting (advance reservations required) – a private tasting of sparkling wines and Pinot Noirs paired with caviar, charcuterie, and all the trimmings. You’ll have your own private balcony in this French-style chateau overlooking rolling vineyards. Heading back, you can stop in at di Rosa, an art preserve that’s considered to have the most significant holding of Bay Area art in the world. For a romantic dinner, try La Toque, Napa&apos;s Michelin starred restaurant at the Westin Verasa. Then mosey over to the Blue Note for some excellent late-night jazz. Day two, mid-valley. You’ll have to get up at the crack of dawn but the romance factor will be well worth it. Take a hot-air balloon ride and drift quietly over the valley floor with your beloved as the sun rises over the mountains. Many companies also include a post-flight brunch or breakfast after you come down to earth. Book with Napa Valley Aloft, Balloons Above the Valley, Napa Valley Balloons, or Calistoga Balloons. Then go to Raymond Vineyards’ blending room to be “winemakers for a day,” after which you’ll take home a bottle of your own special blend, with a personally crafted wine label (you can even order cases to share with friends back home). Ready for lunch? Try the Charter Oak, St. Helena’s newest restaurant by triple Michelin-starred chef Christopher Kostow. After your meal, stroll St. Helena’s charming Main Street, with plenty of shops from casual to high-brow. Or take in a rom-com matinee at the town’s historic Cameo Cinema, which is outfitted with love seats at the back. Finally, for dinner, check out another excellent new St. Helena restaurant, Acacia House at Las Alcobas Hotel for dishes like crispy sweetbreads or tomato leaf bucatini. Day three, Calistoga. Start your day with a hearty breakfast at Café Sarafornia, which has an endless list of omeletts and egg dishes. Then go back in time with a tour and tasting at Castello di Amorosa, an authentic replica of a medieval Tuscan castle, where you’ll swear you’re in an Italian hill town. (Besides, how can you miss the place that translates to “castle of loving”?) There are a lot of options for lunch along the town’s Lincoln Avenue – or try SolBar at Solage along the Silverado Trail. You’ve earned some downtime, so afterward head for a mud bath (Calistoga’s signature spa treatment) at Indian Springs Resort – ideally followed by a couple’s massage. If a bathtub full of mud is a little too adventurous for you, there are plenty of mineral baths and other treatments to choose from. Then stumble back to your hotel to recover from all that relaxation. By now you’ve kicked your marriage off to a great start. With so much romance, surely there’s nothing but wedded bliss in your future!